Excerpts out of the paper published in Vixra, by Kyriakos Kefalas. The following paragraphs are excerpts out of the paper published in Vixra. The selfvariating universe (SVU) is the cosmological model of the Theory of Selfvariations (TSV) proposed by Manousos in (Manousos 2007) and (Manousos 2013b). The Theory of Selfvariations (TSV) relies on the selfvariation principle and on the zero arc length propagation principle (Manousos 2013b,2013d). The selfvariation principle predicts a slight increase of the rest mass of material particles and of the absolute electric charge of particles of matter. The selfvariating universe (SVU) is a static and flat universe, where cosmological redshift is explained without the need of the expansion. It predicts an exponential law for the cosmological redshift/ distance relation (Manousos 2013b,2014a) and a variation of the fine structure constant (Manousos 2013c,§9), which has been measured by Webb (2011). In this paper we investigate the consequences of a larger set for the SV parameters than the one used by Manousos in (Manousos 2014a,§1,3).The investigation leads to a narrow set of possible values. However to accurately fix all SV parameters, a precise determination of the distance of astronomical objects, independent of any cosmological model and a more accurate measurement of the variation of the fine structure constant is needed. The discovery of the variation of α, is a strong support for the TSV, as no other mainstream theory can explain it. We have found that in one case, the SV universe (which begun with almost zero rest masses) is heading to a reversal procedure where the SV rest mass unit will become infinite. After that, it enters a reversed phase where the SV rest mass unit acquires negative values. The reversal time , lies in the future and can be no less than 13 Bill years from now. We also predict an anisotropy of cosmological redshift, for objects of the same distance and peculiar velocity. Fig. 5a: Evolution of SV rest mass unit (eq. 59) with time (Ga), given in M, units. The shaded areas A and C are shown. , is the reversal time and , is the Hubble time. Fig. 5b: Evolution of SV rest mass unit (eq. 59) with time (Ga), given in M, units. The shaded area B is shown. , is the reversal time and , is the Hubble time. The SVU model of the theory of selfvariations (TSV) predicts a flat static non-expanding universe, in which the rest mass of material particles and the absolute electric charge of particles of matter, slightly increase with time. The SVU model conforms with all current cosmological observations (Manousos 2013c, 2014c). It particular it explains the variation, over large distances, of the fine structure constant observed by Webb (2011), since at large distance we see the smaller value of the electric charge in the past. No mainstream cosmology can explain this variation. The rest mass of all material particles follows the evolution of the SV rest mass unit, which we have studied in this paper. At large cosmological distance we observe a smaller value of the rest mass in the past. This, in combination with the variation of the electric charge, explains cosmological redshift without the need of the expansion of the universe and all other assumptions that follow from the expansion and are incorporated in the SCM. The SVU model predicts an exponential redshift/ distance relation, which is very closely matched by the redshift/ comoving distance relation of the Λ-CDM model. This is expected, as the comoving distance of the Robertso-Walker metric is the distance in the SVU model. 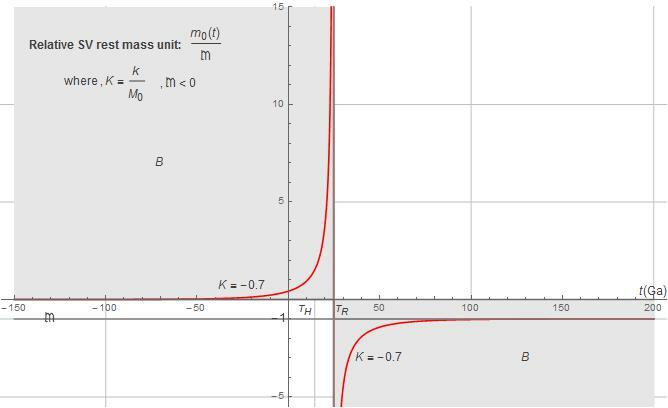 We have found that, depending on the exact values of the SV parameters ,the SV rest mass unit (and thus the rest mass of all particles), will either evolve towards a limit mass constant M, in the infinite future, or it will acquire an infinite value at a finite time in the future, called the reversal time . 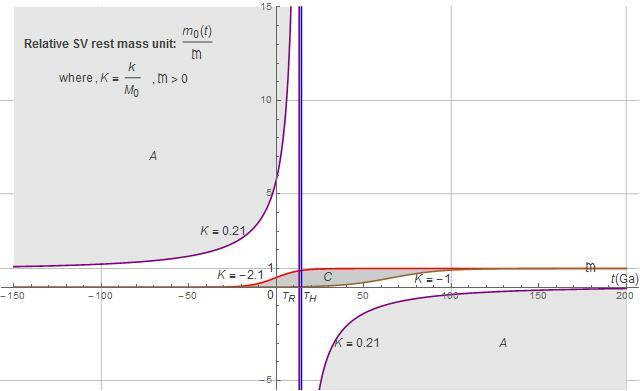 After the reversal time the universe will enter into a reversed phase, where the rest mass unit has a negative sign. We have found that, due to the restrictions of the parameters studied in this paper, the reversal time can be no less than 13Bill years from now. It may however be hundreds of Bill years in the future. Precise measurements of the distance of astronomical objects, independently of any cosmological model, will show the precise values of the SV parameters and thus select between the different evolutions in the context of the SVU model. In the case where, , redshift tends to a limit , at infinite distance. In all other cases redshift tends to infinity. We have found also that the SVU model predicts a fluctuation of cosmological redshift producing an anisotropy over the sky, for astronomical objects lying at the same distance from us and ideally having the same peculiar velocities. This fluctuation is in part covered by the peculiar velocities. The fluctuation however is proportional to redshift, and increases with distance, while peculiar velocities probably have an upper bound throughout the observed universe. Manousos, E., 2014a. The numerical values of the fundamental parameters of the model of selfvariations and the age of the universe. Phys.Int., 5:8-14. Wetterich, Christian.”Universe without expansion.” Physics of the Dark Universe 2.4 (2013):184-187. The full article can be found in Vixra.